If you were to ask me to name an aspect of the hobby's height that I miss most, there's a good chance I'd say micro-games. Back in the late 70s and early 80s, there were a large number of what might be called "mini-wargames." They all had brief rules and simple components and were generally playable over a couple of hours, if that. I was never a wargamer of any sort, but I wanted to be and micro-games allowed me to briefly indulge this fantasy. Among my favorite micro-games were those produced by Steve Jackson Games. Car Wars was originally released in 1980, but the first version of the game I ever saw was the 1983 edition pictured here. This edition came in a small plastic "box" that contained its short rulebook, fold-out maps, and counters to cut out. As its name suggests, Car Wars is a game of vehicular combat, set in a near-future world where oil and food are scarce and battles between heavily armed and armored vehicles -- known as "autodueling" -- are a popular form of entertainment. Of course, the game's thin background is little more than a framing mechanism for a fun little tactical combat game. Players begin the game with a small budget with which to purchase a car, pickup truck, van, or motorcycle and outfit it with as much offensive and defensive modifications as they can both afford and their vehicle can carry. Then they enter autoduel tournaments to test their mettle and win cash prizes with which to improve (and repair) their vehicles, or purchase new ones entirely. Car Wars is a very straightforward game with a tight focus, which made it quite easy for my friends and I to pick it up and enjoy it. Of course, its tight focus also made it somewhat limited, which is why designer Steve Jackson eventually came out with supplements to the game, the only two of which I ever owned were Sunday Drivers and Truck Stop. Truck Stop, as its name implies, included rules for tractor trailers and buses, while Sunday Drivers was the "roleplaying" supplement to the game, as it had rules for playing pedestrians and using buildings in the game. Some friends of mine had a fold-up ping-pong table in their basement, which we used as our playing area for Car Wars. I think we kept the maps from the game perpetually taped to that table (to which we added others as we acquired the rules expansions) for many years. Whenever we'd gather to play one of our RPG campaigns, there was a good chance we'd start playing Car Wars either before or after we'd roleplay. For us, Car Wars was a great pick-up game: quick to play and not particularly mentally taxing -- just the kind of thing teenage boys like. As I recall, we didn't do very much autodueling in our games, preferring instead more larcenous scenarios, with the players generally taking on the roles of criminals and I (sometimes assisted by a friend) the police. We had a lot of fun playing Car Wars. Indeed, some of my fondest memories from those days involve the game in some fashion or other, so much so that I was thinking of trying to get a copy of the game again. Unfortunately, Steve Jackson Games no longer produces Car Wars. There is a PDF version of a "rules compendium," but it's longer than I ever remember the rules being, which suggests that it includes lots more supplementary material than I'd probably want. Plus, I don't like PDF rulebooks. There is a card-based version of the game that I recall hearing about, but it's out of print and, even if it were in print, I'm not a huge fan of card games anyway. That pretty much leaves the secondary market and I'd be amazed if many playably intact copies of the game are still kicking around nearly 30 years later. I'd love to see SJG re-release the original games; I don't expect that to happen. but a guy can dream, can't he? Steve Jackson Games has re-released them, albeit in digital form on the e23 website. The Fifth Edition products are still in print ... no vehicle design rules, but I like the comic book-size booklets, and each comes with tons of accessory mayhem counters. I was always surprised nobody tried something like this during the Clix Boom of the early 00's. We were using matchbox cars for the original anyway. I got a copy of the original (plastic envelope) version, uncut, for about $20 US. (You might spend more on shipping than on the game!) So there are still some out there. Great game. I wish I'd played more of it, but I was in a pretty big AD&D crowd in those days. Car Wars was a fun game. It was a good gateway game to D&D and other RPGs and I used it that way in highschool. "oh so you like car wars did you? You liked having the same driver from game to game? Do you know there are other games in different settings that let you play with the same character from game to game?" I loved Car Wars too, as well as SJ's Ogre and G.E.V. games. Check out Road Kill Rally from Z-Man Games - while it has no car design system and is more of a boardgame than a tac game, there's really no other modern car combat game (that I know of). Car Wars was a great game as well as all those pocket and Task Force Games. I miss those days a lot as well. Cheap games, a lot of fun to be had. Chitin was my favorite. Bugs fighting each other while trying to harvest food. Awesome little wargame. Man, I loved that game. It's where I learned what a bootlegger was, a fact I bring up to my family whenever I see one in a movie. I still have a box of my father's old microgames around here somewhere. I keenly remember the disappointing discrepancy between the thrilling, dramatic cover art and the bland, near-blank hex-map "boards" and minimally designed cardboard rectangles that served as pieces. Didn't stop me from enjoying a good game of OGRE or Sticks and Stones, though. Car Wars, played it during lunch in High School. And speaking of Task Force games, during science lab we played Swordquest, Task Force Game #7--my personal preamble to D&D. Those were the days, as Archie Bunker use to say. This game and the Milton Bradely printing of Axis & Allies are what started me down the 'gamer' road. Old school Car Wars rocked. It would have rocked ferociously if the acceleration on the vehicles was doubled. Forget all the funky stuff that came later, the core rules (and maybe DEATHTRACK) are all you need. Deathtrack of course for the Chassis and Crossbows rules. I've still got my micro version of Car Wars, Truck Stop, Sunday Drivers and Boat Wars. It's been a while since I've played them though. I talked to Steve Jackson a few months ago (he was at my local Game Store) and mentioned Car Wars, it sounded like he wanted to re-release it but didn't know when he'd do so. I started as a wargamer (AH, SPI). Metagaming's Melee/Wizard microgames were my gateway to RPGs. I still have my Car Wars microgame. I remember huge miniatures table layouts for Car Wars games at conventions in the mid-80s. Car Wars was the best. Just like all the other Microgames, you could carry them in our pocket and play them just about anywhere you wanted to. Not like today where your ONLY expected to play 40K. Never played Car Wars but this post reminds me of one of my favorite gaming podcasts, Roll 2D6, which I think got its name from the main kind of roll in Car Wars. They are still on iTunes, though they are defunct. Their episode on RPGs is nothing short of brilliant, taking a look at the description of what RPGs are from the rule books themselves. Wow - I remember this one - I had the black plastic box version. I used to love the old Microgames - Melee, Wizard, and Deathmaze - hey, remember Kunk Fu 2000? That was a trip! Car Wars is a great game. I was part of the first official AADA (American Autodueling Association)group out of Omaha, NE known as NOVA (New Omaha Vehicular Association). Man, those were some heady days. We playtested a lot of stuff for SJG. Tanks were a big one. In fact, we had made rules for transformers when they were first popular. Yeah, we had cars and trucks battling Deceptacons. What a blast! There is an apparently similar Java based version called Darkwind, but I have not had the chance to try it out yet. Around 2005 Steve Jackson tried the re-releasing packaged as comic book sized games, with all of the counters you would need as cardstock inside. They're still in print, look for the "Car Wars Division" books at http://www.sjgames.com/ourgames/everything.html?line=7&show=print . It captures the small, cheap, and fast of the early games, but at the cost of completely eliminating the car creation rules. The creation rules were updated for publication as their own book. They even entered public playtest, but they were never released. I'm guessing the market proved too small to support it. Typical Car Wars game circa 1985. Step 1: Spend 3 hours designing vehicles (most of the time we would all end up with a pick-up with all the armour at the front and twin Rec-rifles. Step 2: Play a duel style game where each car would make a pass and then crash whilst attempting an impossible turn. Step 3: Reflect on our shortcomings and plan improved designs for the next game a week later. That probably went on weekly for about 6 months but I still have fond memories of those games. My friend owned Car Wars and I know I read it but I can't be sure I played it. Did Games Workshop create a similar game that had road tiles? I still have all my old Car Wars stuff. I love that game, I even ran a game of it on the web a long time back, play by email where I'd use The Gimp or Photoshop to update and post the results. Good times. The new version of the rules are a lot of fun too, but the way they released them was a problem. No construction rules wasn't a big thing for me, but I know it was for a lot of people. Also they released them by division, so they released the tiny division five cars first, but if you wanted the more fun division 10 and 15 cars, you had to wait a couple months. But that aside, I did like the new rules. Definitely worth a look. I played the Autoduel video game on my friend's Apple II. Good times. I never played the original, but the card game version of Car Wars is fantastic. I regularly run it and Battle Cattle (same rules) at conventions, and it's a huge hit. Non-collectible, and extremely fast playing. The thought just struck me on how maybe SJG should re-release the little black box, just as WotC has re-released the 'red box'. Probably not worth the effort, but I'd still buy it. Did Games Workshop create a similar game that had road tiles? Indeed. It was called Dark Future, and spawned a line of novels, as I recall. In a move of surprising generosity, GW have made the rules available for download here. It's similar in concept to Car Wars, but at 220 pages, it's no micro game! Coopdevil at Fighting Fantasist has created a similar game called Axles and Alloys. The link is at the bottom of his blog. I've still got a ton of Car Wars stuff at home, and even though I haven't played them in a while, I still am very fond of them. There's also pdf copies of what looks to be every issue of ADQ ever. Now that was a gaming mag - half in-game articles, half gaming articles, some fiction, and a few advertisements which presented you with car designs. 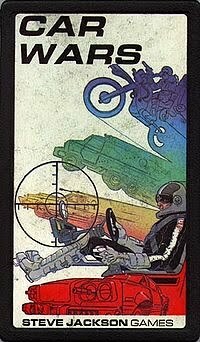 Oh, and there was an earlier (1983) GW game called Battle Cars. This one used card counters for playing pieces, although appropriate Citadel miniatures were available, of course. A friend of mine owned a copy and raved about it, but for some reason we never played it. I played it, but it never bit me or my group. I did see someone running a big game of this (or something similar) at Origins last year, using Matchbox/Hot Wheels cars as miniatures. I suspect that your micro-games aren't so much gone as gone PDF. Avalon Games offers a long line of "mini-games" on e23, many of which are mini-wargames, and I believe I've seen them on other PDF sites from different companies. I was a Car Wars freak and bought everything I could for it. Oh, the fun we had mixing it up with cars, trucks, boats and even blimps. We drew the line at Tank Wars, though. Interesting idea, but too much time to set up. Doesn't mean I didn't buy it, though. I think I still have the little AADA pin somewhere. This was a great game. John Fiala, this is the Mini Car Wars introductory pamphlet that SJ Games put out in 1987. It was based on a simplified version of the pocket box rules (no rules for tire damage, as I recall). It gave you the bare minimum that you needed to try the game, but the rules are incomplete. Taxonomer_X, I also still have my AADA pin! GW have made the rules available for download here. yay, all the dark future articles and rules from white dwarf. i lost some of those and have been looking for ages. There may be a reason why our games only lasted a second or three in game time. I find most good wargames are role-playing games. If they are not, they tend to be rather unrealistic. In a good game you identify with the units under your command. * This difference is magnified as you reduce the game to a single piece (be it a car in Car Wars or a starship in Star Fleet Battles [another game which was pure in it's original microgame format and corrupted by later expansions]). I have an intact and playable copy - but it's not for sale, sorry. We used to tear things up in the Armadillo Autoduel Arena on a regular basis. That map was a blast. "I find most good wargames are role-playing games." I agree with this. I don't need a complex background, but just a simple story is enough to give me a connection to the world, and that makes it more fun for me. There seem to be a lot of games from around the same time that are fondly remembered and out of print. Maybe someone should retro-clone them? All of the SJ mini games were awesome! I also loved his earlier Metagames stuff (Fury of the Norsemen, Melee, etc). I recently picked up the old GURPS Auto Duel supplement, which tries to flesh out the world and all the RPG aspects. One of these days, I'll actually use it! The Car Wars card game was okay, just not the same experience. I barely remember a thing about it, other than I and some friends played it in some restaurant or other. The original Car Wars was greatly enhanced with a few supplements. I got tired of the Uncle Albert's catalogs constantly coming out with new stuff, but Autoduel Champions (Car Wars with superheroes) and Car Wars Deluxe were inspired supplements. I still have Boat Wars, Ogre, GEV, Car Wars, Truck Stop in the original little plastic packages.